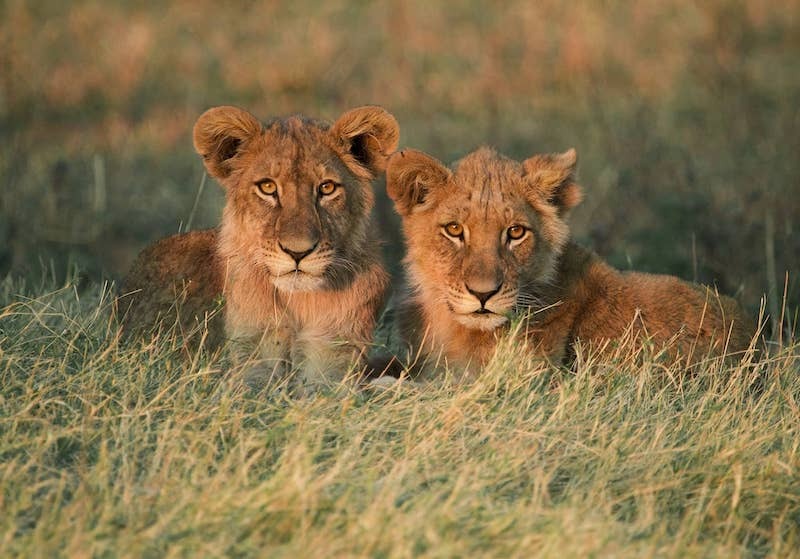 If you’re searching for an unbeatable wildlife experience, you’ll certainly find it at Kanga Camp. Driving through this private concession of Mana Pools National Park, you see why this World Heritage Site is renowned for its biodiversity, including over 350 bird species. Kanga welcomes wildlife enthusiasts who are looking to experience close encounters with animals such as lions and even leopards! 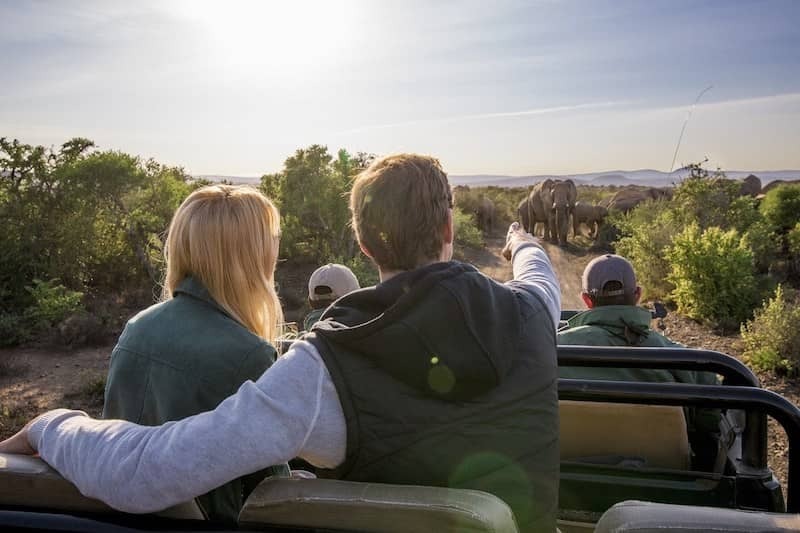 Standing on the viewing decks overlooking the Kanga Pan, you’ll find the area is always dotted with elephants and an abundance of birdlife. The friendly staff lead you into rustic interiors, all the while letting you know that their essence is a celebration of intimate knowledge about the landscape. You notice touches of culture within the walls, giving you an insight into those who’ve lived within the region for generations. A sophisticated tented camp experience. This camp is warm and inviting, completely secluded in a ring of trees. With the pan right in front of the viewing deck, you’re afforded glorious views of surrounding nature and meandering wildlife. In terms of design, the camp is built in the old-world safari style with dark wood throughout and charmingly rustic interiors. Due to the intimate size of the camp, there is a more personal style of service with special requests and a ‘good morning’ smile delivered by the friendly staff. Kanga makes the most of what the Mana Pools region has to offer, curating your entire experience around the wildlife and different biomes. This is a wonderful getaway for those looking to be completely immersed in the wild without needing to venture out further into the bush to see wildlife. Families are also welcome but children need to be over the age of seven due to the nature of the camp, which is unfenced and very wild! Mana Pools is known for being one of the most picturesque backdrops for photography expeditions and Kanga Camp is no different. The camp has a ‘Hide’ which is ideal for close-up photography being in proximity to the Kanga Pan right underneath the deck. 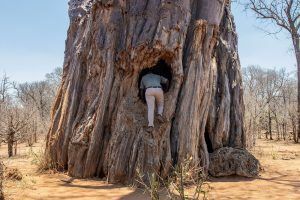 Simply settle in with your binoculars and wait for the animals to come to you or embark on a game drive where guides will show you interesting natural phenomenon such as ancient trees. 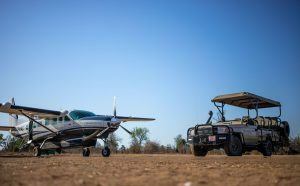 Otherwise, join Zambezi Expeditions, which arranges plenty of day tours and adventures. An magnificent way of getting to know the area is by canoeing through the rapids or fishing for diverse species in the Zambezi River. 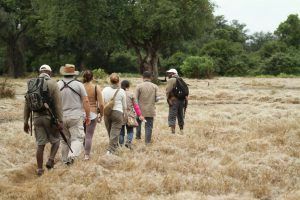 One of the camp’s most enchanting experiences is the walking safari that is led by a knowledgeable guide. Make your way through the bush during the early part of the dry season when there is still some water in the pan. 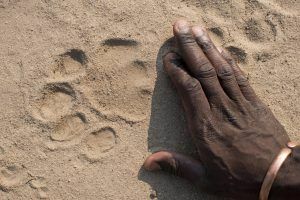 Uncover tracks from antelope and lions alike and learn more about the ancient trees that have been a home for many fascinating creatures. 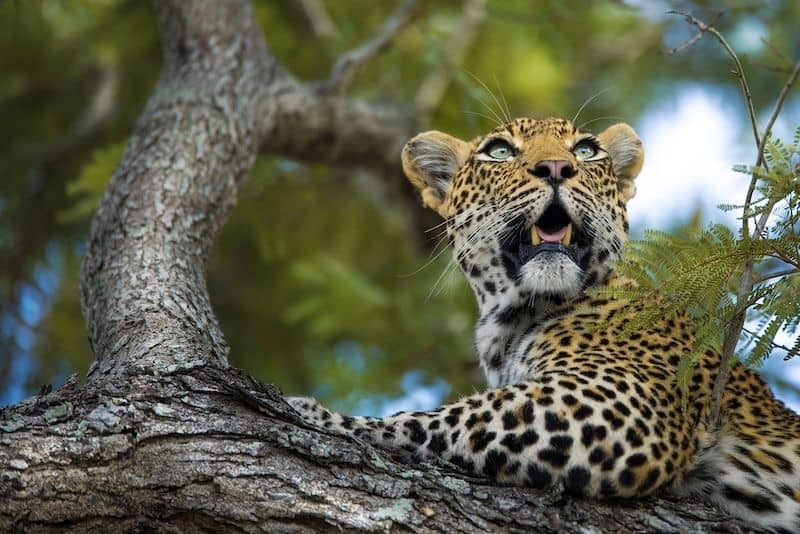 As the camp is unfenced you can also settle in on the viewing deck for a wondrous nighttime show of leopards and other cats that pad through the bush under the cover of darkness. 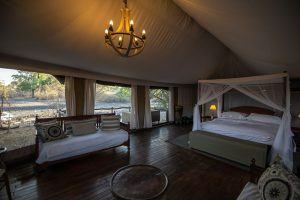 Kanga Camp is made up of only six Meru Style Tents, which include a Honeymoon and Family Tent. These tents are very spacious and are decorated with soft hues, allowing you to unwind and spend the day leisurely moving through the space. The canvas creates an impression dating back to explorer times with traditional artworks and classic safari interiors. Each of the luxury tents are designed with floor-to-ceiling windows and have an outdoor bathroom, allowing you to start your day to the sound of birds in the overhanging trees. According to your preference, you can also opt to sit on your tent’s private deck with breakfast, overlooking views of elephants, zebras and antelope that frequent the pan. When you’d rather be out enjoying the afternoon heat, you’re welcome to continue viewing them from the comfort of the splash pool. Dining at Kanga Camp is one of the best experiences on offer in Mana Pools. The meals are traditional but well presented, which gives a fine dining feel. 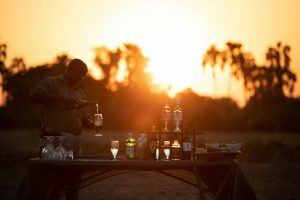 They are served on the viewing deck or out in the bush for special evenings under the stars. 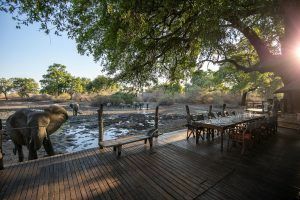 If you’d like to have breakfast or lunch with unparalleled views of the water and animals, the staff at Kanga Camp are happy to cater to your needs and preferences. Otherwise, enjoy your favourite drink upstairs where it’s a little more shaded from the heat. This camp is closed during the rainy season (November to March) but the drier winter months bring more wildlife out of the bush for your viewing pleasure as they’re all in search of the precious water sources that are left. This is mainly Kanga Pan, which becomes a watering hole right in front of the camp. The closest airport to the camp coming in to Zimbabwe is Robert Gabriel Mugabe International Airport in Harare while the nearest airstrip is Dandawa. 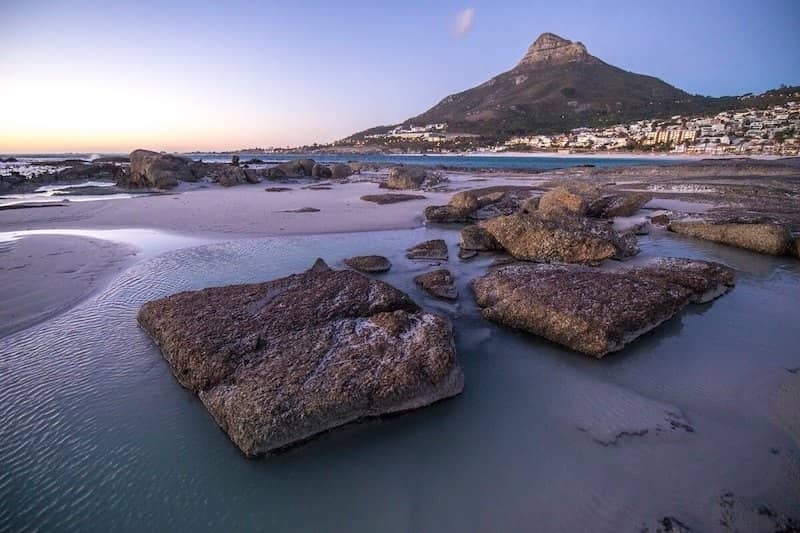 From here you’ll still need to take a 30 min drive to the camp, but luckily you’re spending those minutes in the midst of sensational wildlife, giving you a sneak peak of what’s to come during your stay. 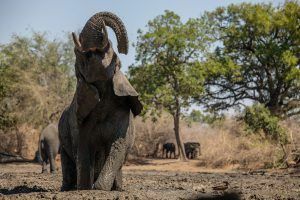 Book your once-in-a-lifetime journey to Kanga Camp with one of Rhino Africa’s travel experts today and treasure all that Mana Pools National Park is renowned for.